May 23, 2018 (Plot Planted): The ENREC plot consisted of eight rows of a dicamba-resistant variety and eight rows of a dicamba-sensitive variety planted in a west-east direction into 30-inch rows that were 50 feet long. (Both were the same MG 2.4.) The varieties were not distinguishable from each other during vegetative development (i.e., both had identical calendar dates for Vn stages of VE (emergence), VC (V0) (cotyledon stage), V1 (unifoliolate stage), V2 (1st trifoliolate stage), etc. (Fehr and Caviness, 1980) and, as expected, identical node accrual rates from V1 onward (Figure 1). Figure 1. 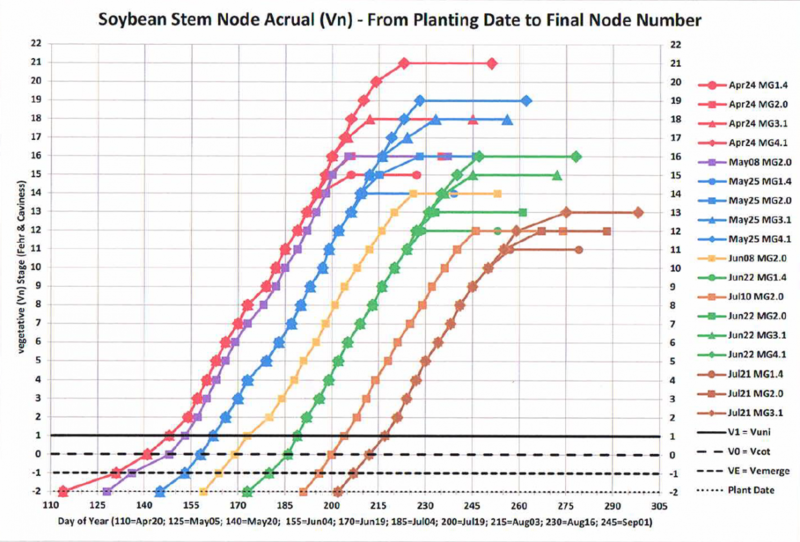 Main stem nodal leaf accrual patterns in soybean cultivars of four maturity groups (four symbol types) planted on differing dates (shown at chart bottom). Note the linearity of node accrual rates (3.7 days between successive nodes) begins at stage V1 (horizontal line) and does not cease until the Vn stage at which the cultivar attains stage R5 (which differs by cultivar MG). These 2017 data are from plots grown at the Eastern Nebraska Research and Extension Center near Mead. June 26 (Injury Observed): The pinched drawstring injury typical of dicamba was observed in the dicamba-sensitive variety plant leaflets (Figure 2), but NOT in the dicamba-resistant variety. On June 26 both varieties were determined to be at stage V7-R1. Note: No dicamba-containing herbicide had been applied to this plot (or to any other of the 35 plots at ENREC), nor was any such herbicide used in 2018 in the ENREC sprayer tank. July 5 (Plant Examination): It had become clear that the dicamba-sensitive variety plants (eight rows on the south side of the ENREC plot) were exhibiting observably significant leaflet tip injury (Figure 3a), though that injury was observably less in the west half (i.e., eight rows there were located in the cereal rye cover crop area (Figure 3b). Figure 2. 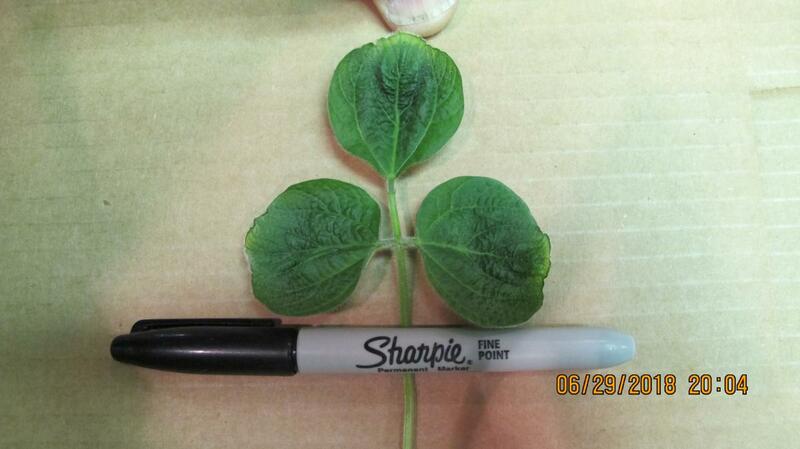 These nearly fully developed trifoliolate leaflets were directly exposed to dicamba before cell division at the upper leaflet margins had been completed, This resulted in a “drawstring” injury symptom at the leaflet tips that shortened leaflet length. Figure 3a. A July 5, 2018 photo of side-by-side rows of a dicamba-sensitive variety (left) and a dicamba-resistant variety (right). Both varieties are MG 2.4, were planted on May 23, and were at the same soybean vegetative stage of V9 and reproductive stage of R2 on July 5. Figure 3b. The same field as Figure 3a, with eight rows of a dicamba-sensitive variety on the left and eight rows of a dicamba-resistant variety on the right. The left eight rows had been fall-planted with a cereal rye cover crop that was terminated on May 10. The dead cereal rye stems remained upright for several weeks after planting. Nebraska Soybean Production and Dicamba Use Survey. Find information on the survey and how the results will be used here. Dicamba-induced leaflet tip injury can significantly reduce the length of an affected leaflet (Figure 2), thus negatively impacting the soybean crop’s capacity to capture incoming solar energy for use in photosynthesis. On July 5, examination of the adjacent plant rows of injured dicamba-sensitive (Figure 3a) and non-injured dicamba-resistant varieties (Figure 3b) showed that the eight rows of the sensitive variety had visibly less overall leaf area at multiple stem nodes, and also had fallen behind the eight rows of the resistant variety relative to normal seasonal progress to full canopy closure. Clearly, the leaf-injured dicamba-sensitive variety was precluded from collecting as much daily solar energy as its counterpart. July 18 (Node Counting): To determine when the ENREC plot might have been exposed to dicamba, the forensic analysis described in a prior CropWatch article was applied to this field as a test case. On July 18, 10 random plants were collected from each variety to assess their vegetative (Vn) and reproductive (Rn) stages; both varieties were found to be at the same V13 R4 stage. The 10 plants of the injured dicamba-sensitive variety were then placed on a pickup truck tailgate and their main stem nodes were ink-marked upward with a zero (0) at the cotyledon node scar, 1 at the unifoliolate leaflet node scar, and at nodes 2, 3, 4, and on up to stem node 13. The lowest node at which the trifoliolate leaflets were exhibiting a "pinched drawstring" leaflet tip was determined to be main stem node 3 in all 10 plants. It was windy that day, so a yellow ruler was laid on top of those 10 plants so that the node 3 ink mark was showing on each plant just above the ruler (Figure 4a). Small wood stakes were added to point to the node 3 terminal leaflet tips that exhibited the "pinched drawstring" injury. Lateral leaflet tips of the node 3 trifoliolate leaf were also exhibiting the leaflet injury, but could not be held down in the wind to be seen in this photo. Figure 4a. Plants collected on July 18 from the dicamba-sensitive variety. A yellow ruler was use to hold down the plant stem bottoms (on this windy day), but with the (ink-numbered) stem node 3 kept visible just above ruler top edge. Another ruler was used to hold down the plant tops, with the wooden stick used to hold down the node 3 trifoliolate leaf, so that the pinched draw-string injury on the node 3 terminal leaflet could be viewed (via the small plot stakes pointing to those terminal leaflets). The lateral leaflets were injured but are not viewable here. Only six of the 10 plants are visible in this photo, but the other four were similarly injured. Figure 4b. In all 10 plants, the uppermost node exhibiting pinched drawstring leaflet injury was node 9. The terminal leaflet “centers” are ink-marked 7 (left) and 9 (right) to reflect their stem nodes. The node 10 terminal leaflet is located at the far left in this photo and it showed no leaflet tip injury. The next forensic step was to identify all higher stem nodes with leaflets exhibiting a pinched draw-string injury. Injured leaflets were found at nodes 4, 5, 6, 7, 8, and 9, but not at nodes 10 to 13, in all 10 plants (Figure 4a). The leaflets at nodes 7, 8, and 9 (Figure 4b) were likely in a leaf primordia stage when the (then) emerged leaflets at 4, 5, and 6 were presumed to have been directly exposed to dicamba. Leaflets at nodes 7, 8, and 9 were still injured due to the translocation of dicamba from the exposed leaves to the not-yet-emerged leaf primordia developing at the stem tip. The degree to which dicamba is translocated continuously to the stem tip is dose-dependent, determining how many successive leaf primordia at the main stem tip are affected in a given dicamba exposure event. Of the 13 main stem nodes that subsequently appeared, node 9 leaf was the uppermost one exhibiting dicamba injury (via translocation). Six cycles (9 - 3) of 3.7 days (per each new node) would be expected to occur between stages V3 and V9, totaling 22.2 days (6 x 3.7). Figure 5a. SoyWater projected calendar dates for the Vn and Rn stages for the ENREC plot planted with the two MG 2.4 varieties on May 23. This screen shot captures the portion of the SoyWater table showing a June 12 projection of V3 attainment for both varieties. The V3 pop-up photo is generated by a mouse click on the V3 p text in the left side of the table. Figure 5b. This screen shot captures the portion of the SoyWater table showing a July 18 projection of V12 R4 for both varieties. The UNL SoyWater website, which is used for irrigation scheduling in a given soybean field, also can be useful in a forensic analysis because it projects the calendar dates of the Vn and Rn soybean crop stages via the SoySim crop model embedded in SoyWater, when the planting date and variety MG are known. For this particular ENREC plot, the SoyWater calendar date projections for V3 and V13 were June 12 and July 17, respectively (Figure 5), which were about the same as the calendar dates ascertained for the in-field manual plant sampling method discussed above. The wind direction was consistently uni-directional from the south or southeast on most days/nights, except for one time: from mid-afternoon on June 11 to mid-morning of June 13 (Figure 6 bottom right). The wind shifted from the south to the northeast between 2 p.m. and 6 p.m. on June 11, though the overnight light winds came from the west-southwest. In contrast, from 2 p.m. to 6 p.m. on the afternoon of June 12, the wind was from the northeast. Figure 6. Hourly solar radiation, air temperature, and relative humidity values (left graphs) and wind speed/direction values (right graphs) recorded from June 11 (0100 hours) to June 17 (2400 hours) at the High Plains Regional Climate Center's automated weather station one mile north of the ENREC plot site (Station #A255369). The horizontal axis in each graph was scaled in 24-hour values. The tick-marks above the 11, 12, 13, 14, 15, 16, and 17 values denote the 12:01am “start” of each of these June days. In the wind direction graphs, the left axis has azimuth degree units, but the right axis has the degree-corresponding cardinal points (N=0, E=90, S=180, W=270). (View degree ranges for common wind directions used in these data sets.) Note: The bottom right graph data spans just three June days (i.e., 11, 12, 13 with 11.5, 12.5, 13.5 denoting noon). Solid vertical lines define the four successive six-hour daily segments (i.e., 0-600, 600-1200, 1200-1800, and 1800-2400); dotted vertical lines define the two-hour time frames within these four. The ENREC site is bordered on the south by large acreage of rangeland, on the west and north by tall tree windbreaks, and on the east by a center-pivot field of corn. It is now known that this corn field was sprayed with the corn herbicide Status (5 oz/acre) with AMS (2.57 lb/acre) on June 12. Based on a sprayer operator record, spraying started at 1:47 pm (with wind speed / direction recorded as 6 mph out of north-northwest) and ended at 3:47 pm (with a 3.5 mph wind out of the north). In contrast, as noted above, the wind was from the northeast from 2 to 6 p.m. at the weather station. Gaspar, Adam, John Gaska, Mimi Broeske, and Shawn Conley. A Visual Guide to Soybean Growth Stages. University of Wisconsin-Madison. Rees, Jenny, James Specht, Randy Pryor, Todd Whitney, Amit Jhala, Robert Klein, and Stevan Knezevic. Potential Off-Target Dicamba Movement from Corn Applications, Nebraska Extension CropWatch.unl.edu, Feb. 15, 2018.